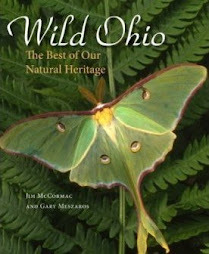 Ohio Birds and Biodiversity: Red bat, in flight! 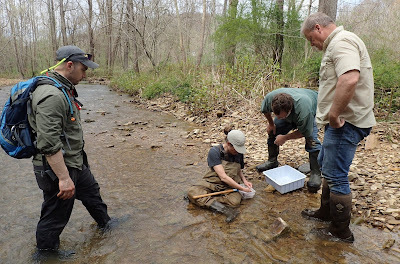 Last Monday, Debbie DiCarlo and I were doing some pre-casing of field sites for our photo workshop (CLICK HERE for more info), which began the following day. 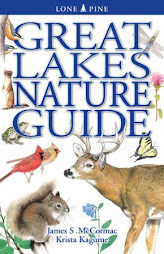 She had not seen the fabulous and expansive Clear Creek Metropark, so we buzzed in for a quick overview. 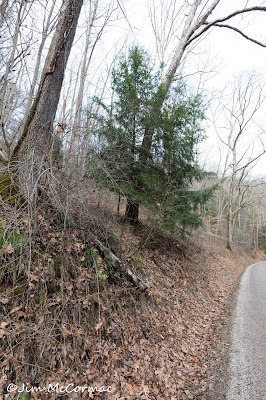 We weren't long on Clear Creek Road, which follows the stream of the same name, when an eastern red bat zoomed out of nowhere and right over the vehicle! I tossed the Jeep to the side of the road and out we leapt, to better see this amazing aerial beast. It didn't disappoint. The bat was actively feeding on this unseasonably warm winter day (mid-70's F! ), and was patrolling a regular section of road. Plenty of moths, flies, and other insects were out, so the hunting was good. 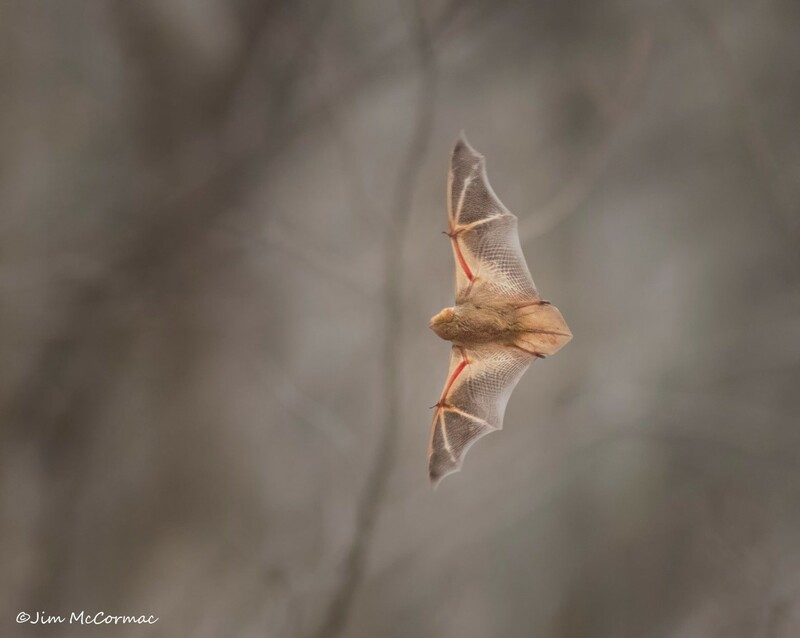 The red bat, caught in flight. I won't tell you how many shots I fired off to get one or two keepers. This one was the best. From afar, bats don't look all THAT fast, but believe me, they are. 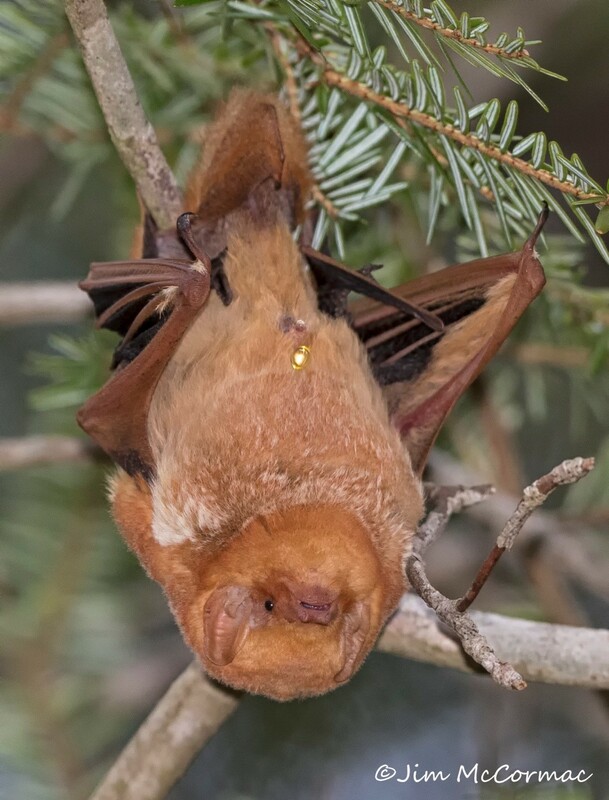 A bat on the hunt is also prone to unbelievably fast directional changes, when it jukes or jags after a small insect. Keeping a camera on one is tough to put it mildly. This image was made with the Canon 7D II and the amazing little Canon 300mm f/4 lens. The latter is fantastic for flying objects, as long as they are fairly close. Settings were f/5 and 1/1000. Light was dim by this point in the day, necessitating a too high ISO of 1600. But I'll take it. Good thing I didn't blink. The bat made an astonishingly rapid jig and flew right into the boughs of a small deciduous sapling right in front of that evergreen hemlock on the roadbank in the above photo. Despite seeing almost exactly where it went, it still took us five minutes to discover the roosting bat. They blend astonishingly well with plants, looking much like a hanging dead leaf. Here's the bat, hanging upside and perhaps pondering the odd admiring bipeds below. Once we saw where it was, we rushed back and got some photographic heavy artillery to make portraiture shots. These images came out far better than did the in-flight shots, I can tell you. Here, the bat is in the act of urinating. 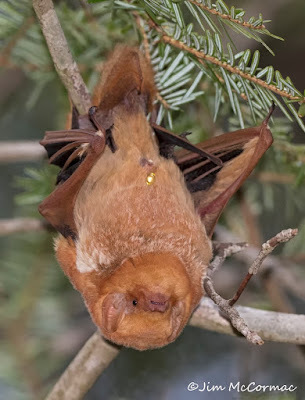 I caught a tiny little golden orb of bat effluvia in midair. And no, it didn't hit the bat in the head. The little animal artfully expelled the golden drops out and over its head. 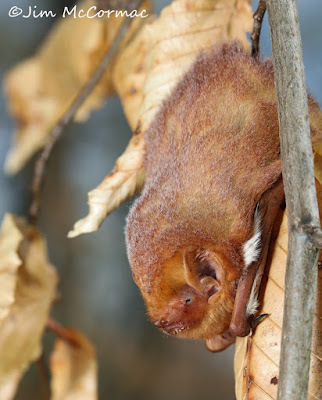 This shot is from last April, and shows a red bat roosting among beech leaves at a locale in Highland County, Ohio. Red bats are highly migratory, and spring is a good time to encounter them. 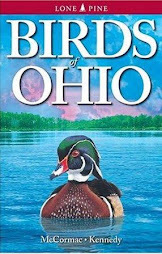 The frequency of wintering red bats in Ohio is, insofar as I know, poorly known. Most of them undoubtedly winter south of Ohio, but probably do not move all that far. While the bat that we found last Monday may have been an early migrant, stirred by the warm snap, I suspect it was one that was wintering locally. The warm day brought it out of hiding for snacks, most likely. In any event, it provided us with an interesting 2+ hours of bat-watching. What an unusual encounter. At least it would be unusual for me. I would be too stunned to even think to take a picture. I would stare in awe of the acrobatic hunting on the wing. What amazing photos. Thanks so much for sharing. Thanks for your comments, Lisa and Anonymous! It was an extraordinary experience! I had to come back to your article on the red bat,as I saw one over our pond in Adams County this last Tuesday. It was around 5:30 PM. I have never seen one out there before. It was awesome!